If you are like me, and you’re a mom, you’re probably a) wearing yoga pants that have never seen the inside of a yoga studio and probably never will b) yelling at somebody shorter than you and/or c) eating an entire block of cheese one-handed, like a burrito. Okay, so maybe that’s just me. But the thing is, I’m pretty sure it’s NOT just me. Motherhood has been both the bane of my existence and my reason for living these last 4.5 years (yes, these coexist. You know; you’re a parent). Yes, I love my two boys more than anything and everything combined, and yes, it is really, really nice to be needed (except when you’re peeing). But motherhood is also seriously, constitutionally hard. I know I’m not alone — and yet, sometimes it feels that way. Because even though there are a lot of mom bloggers and writers out there (AND DADS! yes, also DADS!) talking about this hard-ness, there are hardly any shows or movies that most of us can relate to, as parents, that are honest and funny and raw and real and that deal in these super challenging years of raising tiny people. 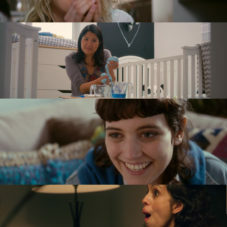 So I was super excited when I learned about a new digital series called CARING that is exactly that — a hilarious show about a couple of moms (one working full-time, one not) and their loving, real, complicated nannies, and all the unglamorous ups and downs that come with rearing small, snot-faced people. CARING is kind of like your favorite show, GIRLS — if Hannah Horvath were a nanny (scary thought, riiight?) and the characters were all forced to actually be responsible. It stars Mickey Sumner as Amy, a stay-at-home Los Angeles attachment parent who’s dying to, well, detach, so she hires overeducated burnout Kate (Hannah Dunne from Mozart in the Jungle) to be her live-in and soon realizes (gah!) she’s jealous when Kate takes her daughter to gymnastics, and lonely enough to bully Kate into “drinking wine and watching the Food Network”. Meanwhile, Amy’s good friend Vicky (Lynne Chen) has a completely different problem — her job is so demanding, she never sees her kids. Her overworked nanny Carla (Diana de la Cruz), an immigrant trying to make a better life for herself and her own teenage kids, is forced to get creative when Vicky seems incapable of actually returning from work on time. In an episode called “Who’s Your Mama,” Vicky takes the day off to spend quality time with her precious twins, only to learn that time at home with two boys under two is like being thrust into a slow, torturous time warp. The show is full of witty one-liners that give us a hilarious window into these women, and what makes them tick (or not, as the case may be). And that’s definitely not preparing educational, Pinterest-level art projects for mama to do by herself while the twins wreck the dining room. I love how the show doesn’t shy away from the uglier underbelly parenting moments when you’re so tired you could sleep on nails, so drained you can’t even two string words together, and so disillusioned you wonder if you made a massive mistake even having kids. The show also dives headfirst into the mom-nanny relationship and, so far, has managed to take some fairly flawed characters and make them relatable, likable, and layered. What working mom hasn’t had nightmares about her kid calling the nanny “Momma?” (It happens. Get over it.). What primary caregiver hasn’t experienced, at some point, that existential crisis of not knowing who they are without their kids (or the kids they are paid to watch)? Juxtaposing the moms’ and nannies’ experiences is a really brilliant move because it reminds us that childrearing is, when it comes down to it, a job — whether you’re the biological parent or a beloved caregiver. I’ve never seen a show do that before, and CARING is setting up a fantastic platform to explore all of our deepest, conflicted feelings about how we spend our time when we have small kids, how we lose ourselves to that (very taxing) work, and the trade-offs we’re forced to make, since we all know “having it all” is as realistic as those dogs that wear outfits on PAW PATROL. If that sounds harsh, or self-centered, or WRONG, then guess what? This show is doing its job. Saying the things we wouldn’t say ourselves, but that need to be said, by somebody, for the love of God. I hope you enjoy CARING as much as I have. You can watch out for new episodes here! I’m excited to keep my eye on this show, which really fills a need for us moms in the throes of parenting small, wild animals (I mean, children), telling its story with an organically diverse cast, and keeping it (snottily, spit-uppily) real. I really felt like the show GOT me. Then I drank a glass of vodka and organized my kids’ sock drawer.